Manchester City and England forward Raheem Sterling is “obscene”. Well, so the Sun told us. The same paper wants us to know: “RAHEEM STERLING has urged England fans to ‘give love’ and cut out the negativity.” England fans, like, the Sun? The plea for unity continues: “The Manchester City star was battered by Three Lions fans at Euro 2016 – there was even an internet hate campaign to bring him home early from the tournament.” And it wasn’t just on the Internet where the former Liverpool player was getting attacked. 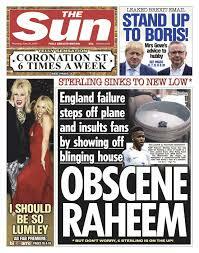 To the Sun, Raheem Sterling was a”hate figure”. The paper went studs up on the young athlete. “England failure steps off plane and insults fans by showing off blinging house,” thundered the paper.” Leave House & Garden and Hello! stuff for the newspaper editors end media barons, Sterling. Know thy place! And unnamed “source” opined: “Any normal person would hang their heads in shame after how they performed in France but these guys come home and show off about how rich they are.” He’s abnormal. Which Premier League star do you think the Sun used to illustrate the story of an idiot, who lives in Bristol? We’ll give you a clue: the player is not mentioned once in the story. 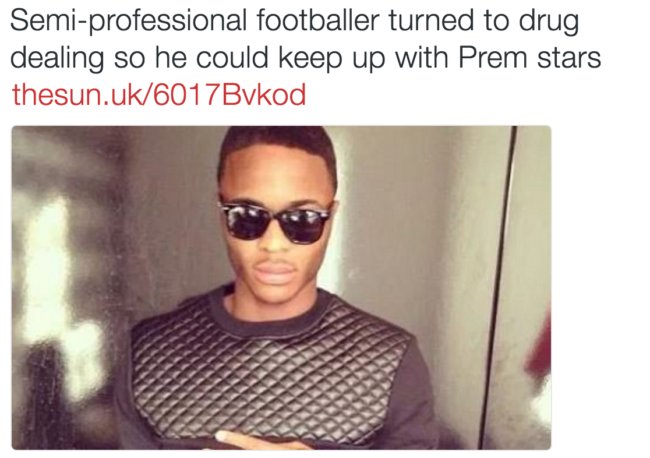 Yep, it’s Raheem Sterling. What is it about Raheem Sterling that annoys them so?